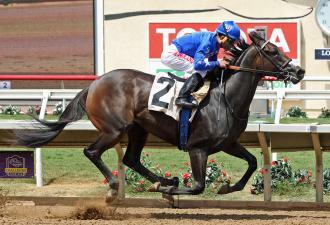 Maiden winner Splashy Kisses will make her next start in a stakes race, trainer Doug O’Neill said. DEL MAR, Calif. – Splashy Kisses, who rolled to victory in her second start Saturday at Del Mar, could return in the Grade 1 Del Mar Debutante going seven furlongs Sept. 1 but is more likely to await the Grade 1 Chandelier Stakes going 1 1/16 miles on Sept. 29 at Santa Anita, trainer Doug O’Neill said. Splashy Kisses drew the rail and was eighth in her debut going five furlongs when facing the highly regarded Brill on opening day, July 18. She won going six furlongs Saturday.